As an antiquities dealer with an archaeology background, I’m always conscious of the “condition” of objects, be they ancient artifacts or modern art. Ancient objects that are in damaged condition are quite normal; that is to say, a complete ancient sculpture, pottery vessel or other artifact, with no restoration, as seen in a museum or auction house, is a rare thing. When offered for sale, an incomplete, damaged object has a lesser market value than a complete example but is still marketable. A modern work of art would never be offered in a damaged or incomplete state. But in theory, there is no difference between the two. Some ancient objects that are broken are assigned a special type of reverence for that very reason. Examples include the 8 foot tall, headless, 2nd Century BC Nike (Victory) of Samothrace at the Louvre in Paris, and the famed Belvedere Torso at the Vatican Museums in Rome, representing either Ajax or Herakles, famed because it helped start the Classical revival in Rome and for Michelangelo’s refusal of Pope Julius II’s request to restore it with new limbs and head. Both are shown below. I’ve been attempting to explore more deeply my own and other’s reactions to broken objects. Why are we drawn to them? Should or can they be made whole again? How did they come to be broken? One method of investigating these questions is to create new works made entirely out of deliberately broken objects. As an artist one of my primary materials is ceramics so it seemed only natural that I should begin this exploration using that medium. My first results are depicted below. 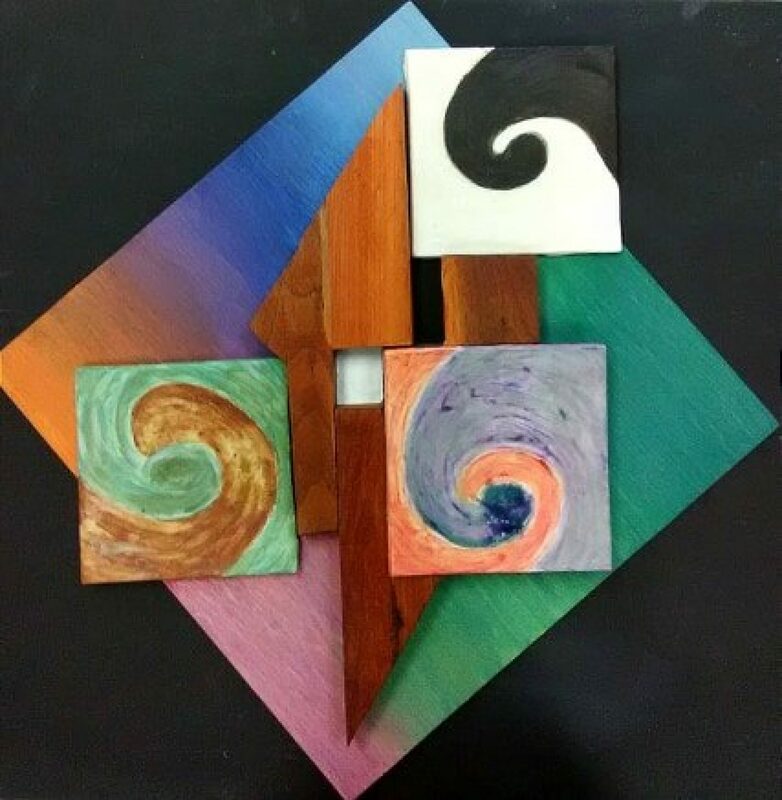 All three works shown here are untitled and all are designed to be wall mounted. The work shown above is the smallest of the three and the second one started. Overall I’m quite pleased with it. Some viewers see a cuckoo clock in it, though that resemblance was unintended. The addition of a damaged and unfinished enamel pendant to the piece offered a glimpse of “brokenness” in another medium, as well. The piece shown here was the first of the three works started and the last finished. I struggled with finding a suitable method of depicting broken ceramics and fiddled with this first attempt off and on for 2 months, finally finishing it after the other two, more successful works were completed. 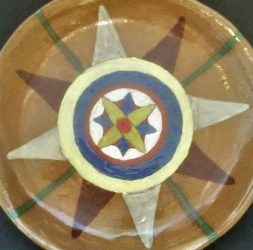 It includes wood board, acrylic gel, acrylic paints, glazed stoneware and porcelain. This was the last piece of the three to get started and proved to be the most successful, in my view. Stoneware slab with porcelain and stoneware shards adhering to it and acrylic paint for the background. In all three works, large fragments of both stoneware and porcelain were glazed, sometimes in combination with underglazes, then broken with a hammer or by a process similar to flintknapping after firing to achieve the right shapes and sizes. All are available in my Etsy shop. Because the state of “brokenness” is so fundamental to my role as an antiquities dealer, I have no doubt that I will return to the subject in my own work in any number of ways over time. I will, of course, post here when those times come.